I try to fold my fabric, like, once a year. It lasts a little while and makes me feel good. Plus, it reminds me what I have, and I'm able to fit it into the space I have better. 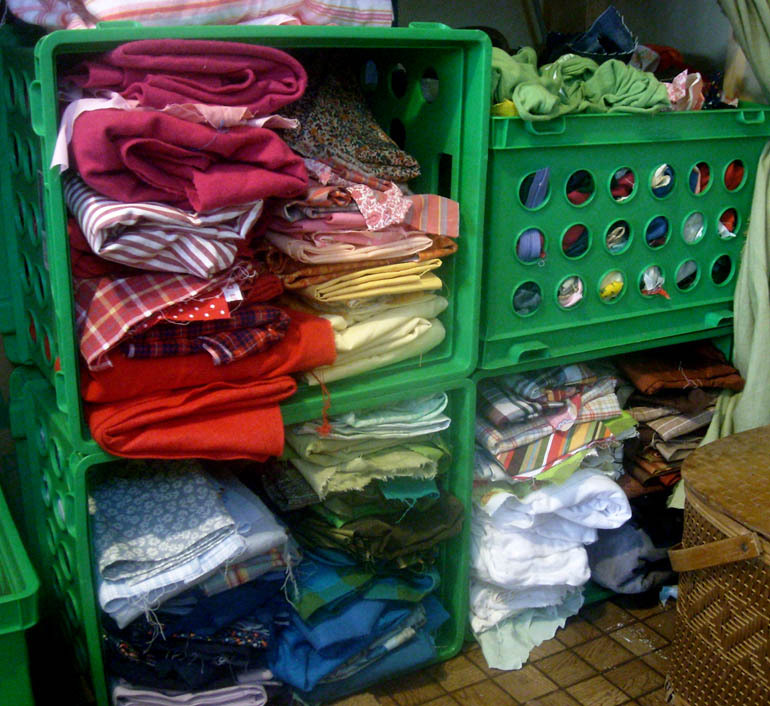 I always consider organizing by size or type of fabric, but in the end, it's always by color. 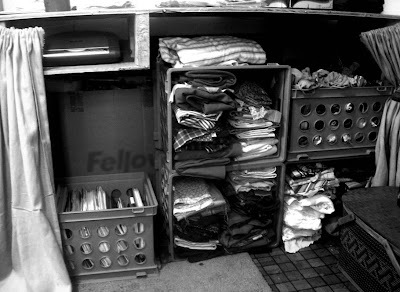 The upright crate is filled with scraps, and this is where most of my favorite vintage bits are. I enjoy dumping it out and rifling through it whenever I need a little special piece. My studio has never been pretty. I get really jealous of beautiful studios, and hope to have my own eventually. But for now, I have a multi-functional space at the end of my galley kitchen. What it lacks in prettiness, it makes up in organization though. John built me an odd sized counter to fit in between the pantry and the wall. The top is my work space, complete with marker board, and neatly labeled piles. Underneath, I have a shelf for my scanner which is essential since I use it so much. My crates of fabric hide the vertical storage for my paintings and canvases. 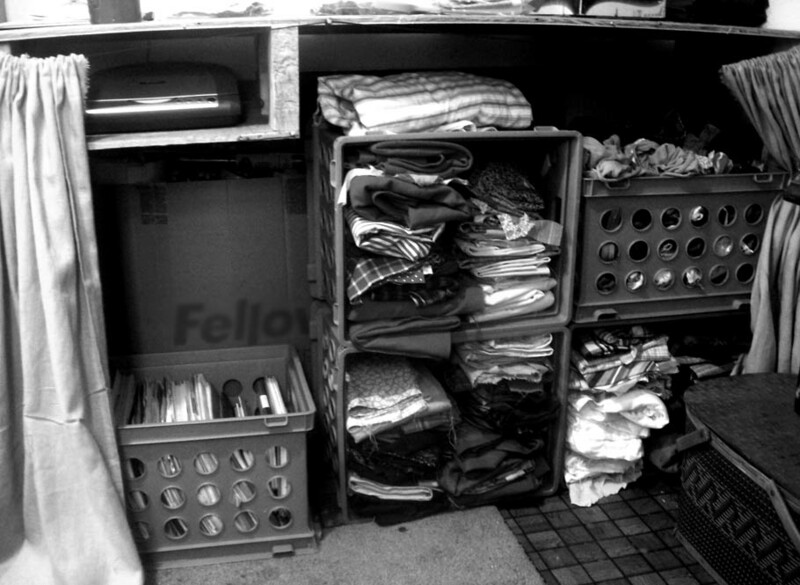 The crate under the scanner is my filing cabinet, with manila folders for pattern pieces and all my old sketch books. The neat picnic basket to the right sits between my counter and sewing table and is full of bags of projects in progress. Each is labeled, and contains all the fabric and bits that I've set aside for that project, so I don't accidentally use them elsewhere. I may be slightly addicted to rearranging all of my small spaces. But I really do think it helps get me excited about the new year and all the new projects ahead. How about you? I just cleaned off my craft table of it's Christmas stuff and it was exciting to think about the next round of crafting (ie. non-Christmas) coming up!